In case you missed it yesterday, MotoringFile got ahold of a few leaked photos of the new R60. After that happened, instead of waiting a few weeks for further photos and details, MINI went ahead and released all of the photos which Gabe has posted along with some analysis of the newest MINI model. Worth the read when you get a chance. Comments so far are pretty positive which is very rare for Motoringfile these days and it’s refreshing to see. Personally, I like this MINI. I like the idea, I like the way it looks, I **love** the interior improvements and don’t even mind the ginormous badge on the back (ala PT Cruiser) that is used to open the boot door. That’s a very interesting question. 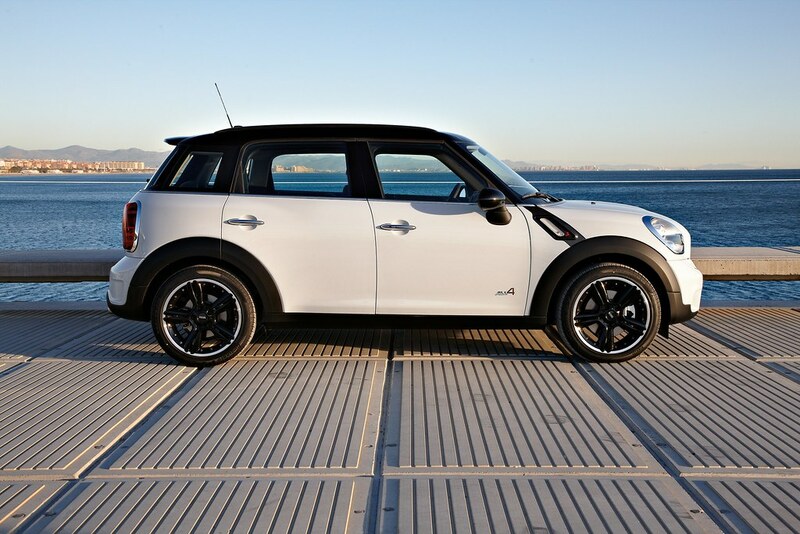 I keep reading that there are lots of people that would love to put this MINI in their driveway. I’m not sure I’m one of them. I really love the idea of having a MINI that can carry 4 passengers and also have that optional all wheel drive. But, if I’m honest, those are features that I don’t _really_ need. I also love the changes to the interior and hope that some of those changes make their way into the other models when they refresh. This is also yet another MINI that we won’t be able to get with a diesel option in the United States. This is a car that would love that powertrain, and I am a driver that would like to have it, but the hippies and tree-huggers that run this fine state I live in have seen to it that we don’t get a decent oil burner. Too bad. I also have a feeling that this car, even in Cooper trim, will be priced much higher than I could comfortably afford and I can’t even fathom what the JCW-All4 beast will cost. Either way, I think this is a car starts getting into the ‘how much is too much for a MINI’ category. At least for me. I love the way it looks, love the interior and love the idea of this MINI and all that it can potentially do. I just don’t think it’s a MINI for me. But, you are going to let me drive yours around the block once or twice, right? Go on over to Motoringfile for Gabe’s fantastic analysis and some great photos. And, you can bet we’ll be talking about this during Woofcast 322 next week. And go over and read what Nathaniel has to say. Equally interesting. i hope they prep it for WRC at some point. it would look fantastic and completely hoss in rally car form, much like the suzuki SX4. i’d never buy one, but i’m happy with how it looks. i still can’t get over the idea of a MINI SUV, but as long as it keeps the MINI brand afloat to continue making decent small car models, i can live with it…i guess. Price is also a concern for me. I imagine that it’d be a lease if I got one and that it’d be our only vehicle, which would justify the higher cost from a budget standpoint. I think you’re right though, MINI is always seemingly flirting with “are you frakking kidding me?” pricing on their fabulous little cars. Prices really seem inflated overall though. You can’t get a decently nice car anymore without spending close to $30k. Even Honda’s new AWD sport wagon version of the Accord is near $32k done well. For a toaster, no less! I guess we’ll see. addendua: now that i’ve seen the full image gallery, i like it more. very clever interior and i do like the front end design quite a bit, much better than the R56, in fact. but it’s still a big MINI! and i bet it doesn’t handbrake turn nearly as well as my R50. I’m sorry but I can’t agree with Gabe or you guys. Though, if WRC is an end goal, maybe, but it’s not a MINI… to me. Till MINI can make interior equipment / technology as good as it is in other cars these days (especially Ford for example), I think they’re missing out – they’re missing out on me, for sure. Nice write-up. I really like the car except for ONE THING- the trim piece above the fender (diagonal piece that contains the S). Why are cars these days including these cheap-looking pieces? (think ford focus). Other than that I like the car. Might be my next MINI in a few years since our family is growing.